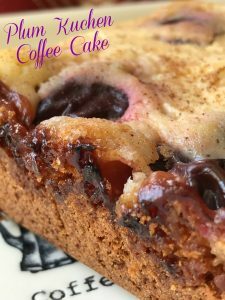 Plum Kuchen Coffee Cake is a very delicious fruit kuchen. Kuchen is German for cake, more commonly thought of as a breakfast cake, or coffee cake. In Germany, kaffee and kuchen is as common for breakfast as bacon and eggs are here in the United States. The kuchen seen most often in Germany is one heavily topped with various fresh fruits. Some of the best coffee in the world are found in Germany and Italy, too. The German immigrants that came and settled in America, brought their kuchen recipes with them. 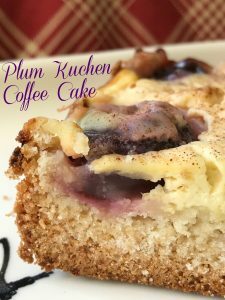 The typical German kuchen or fruit kuchen have been somewhat replaced here with the popular streusel topped, quick-bread type coffee cakes with powdered sugar icing…don’t get me wrong, I love streusel topped coffee cakes as much as the next guy, but the “true” German fruit kuchen has been put on the back burner, so to speak, and needs to make a comeback. Yeast based kuchen is a sweetbread, making it my favorite kuchen. A sweetbread kuchen is rich and sweet. It will bring out the best of the fresh fruits topping it. 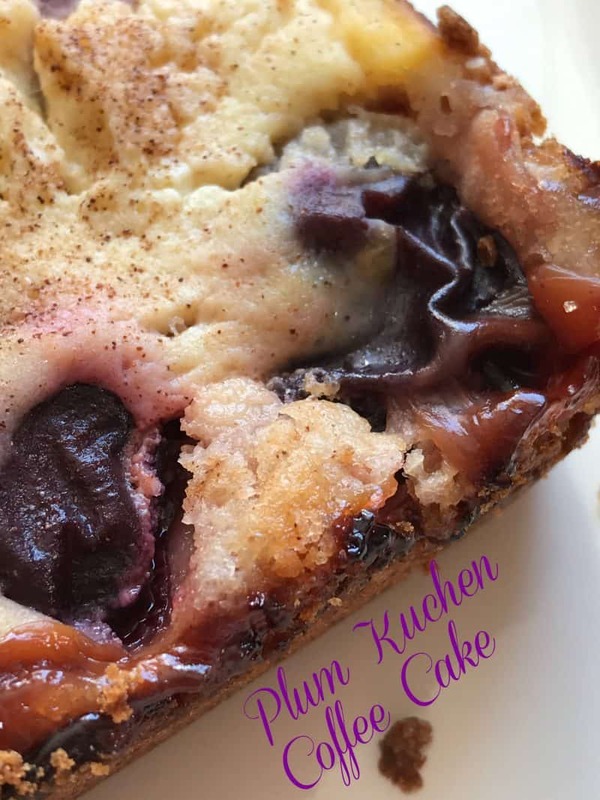 With that being said, some will think this recipe shouldn’t be called a kuchen at all, since I have (mistakenly) made this kuchen with Bisquick…shame on me, not surprisingly though, this kuchen is delicious. Which means kuchen is very adaptable as well as delicious. Keep in mind that the kuchen or cake is not the star of the kuchen. Make sure your kuchen dough is about 3/4 of an inch to an inch thick, this will give you the perfect thickness to your baked kuchen. Lay the fruit on top of your kuchen dough thickly. Fill every open space with fruit until you can’t see any dough showing, then you’ll know you have enough fruit. You can use any combination of spices you like and any fruit or combination of fruits as well. I love the adaptability of kuchen. 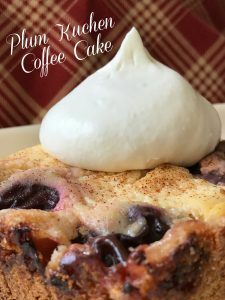 Most kuchen recipes are relatively plain but all kuchens will bring out the best of the fruit you choose to use. The right size pan for making kuchen is important too. It’s better to have too much pan than not enough! So take care in choosing your pan, and make sure it has sides high enough to guard against overflow. No need to set the smoke alarms off! Easy, yet so delicious. This recipe is made easy using Bisquick. Heat oven to 350º F. Grease bottom and up sides of a 9-inch square baking pan with butter. In medium bowl, beat 1/2 cup sugar, butter and egg with electric mixer on low speed about 30 seconds or until smooth. Beat in Bisquick. Spread or pat over bottom and 1 inch up sides of pan. In small bowl, beat sour cream, egg, lemon zest and vanilla extract until smooth. Completely cover the top of the batter with plum halves. (layer plum halves if necessary, remember more fruit is better than less) Spread sour cream mixture over plum halves. Mix 1/4 cup sugar and the cinnamon; sprinkle over the top. Bake 50o60 minutes or until center is set and crust is deep golden brown. Cool 10 minutes; remove side of pan. Serve warm. Recipe Note: Serve with whipped cream or ice cream if desired. Thank-you so much for stopping by and sharing your story with me:) My grandmother, who was an excellent cook was from Holland and my dad’s family was from Germany. 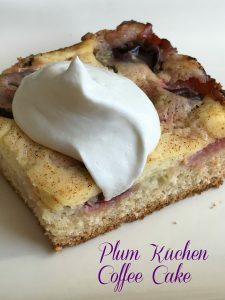 I seem to have been sharing many recipes here lately with German roots and I do love my kuchen! Now I need to dig up some recipes with my Dutch roots too. Doggoned it, cannot remember what kind of Kuchen my grand Mother and Mother always made, just that it was so good. No wonder I crave home made sweets, grew up on them. Will call my youngest daughter as she has most of recipes. My grand mother came here when she was 2 yrs.old with her siblings from Switzerland, the German side. She was always using German words that I still remember some of to this day. They emigrated to Cleveland, OH where I was born in 1940. My Mother was born in 1912. Wish I could remember what year grand mother arrived in U.S. Had to have been in later 1800’s. Do remember all the years of eating her delicious baked goods. My Mother was one of 7 children, 5 of which were girls so they all were excellent cooks and bakers. Wish my memory was better. Has fallen off since my Mother died in 1998.